This fall, the east coast experienced one of the worst hurricanes in memory. Hurricane Sandy came roaring ashore just days before one of the biggest college application deadlines across the country (November 1). One school in Fairfield County, Connecticut lost power, but the guidance department was still able to stay in communication with families and submit forms on time with Naviance. After Hurricane Sandy, our school community was without electrical power for the entire week leading to November 1st. Anyone working in the field of college admissions will understand the anxiety felt by high school seniors and their parents unable to communicate with their high school counselors about their college application concerns at this very crucial time. The school’s computer server was down so I could not remotely access our student management system, but I could access Naviance. Since many students and their parents can receive e-mails on their “smart-phones”, I sent an e-mail via Naviance to all of our seniors and their parents assuring them that colleges will understand the situation and will be lenient if November 1st deadlines are not met. I also explained that Naviance was running and that I could indeed submit any documents already loaded into Naviance. I also offered to e-mail any individual college admissions department on behalf of any student concerned that their materials would not arrive by the deadline. Because our seniors had already loaded their intended colleges into Naviance and my office keeps our college contacts up-to-date in Naviance, sending that e-mail was as simple as clicking on the college’s name, scrolling to our contact’s name, typing the e-mail, and pressing “send”. Most of the colleges responded within 24 hours and I could forward that response back to the student via Naviance very easily. 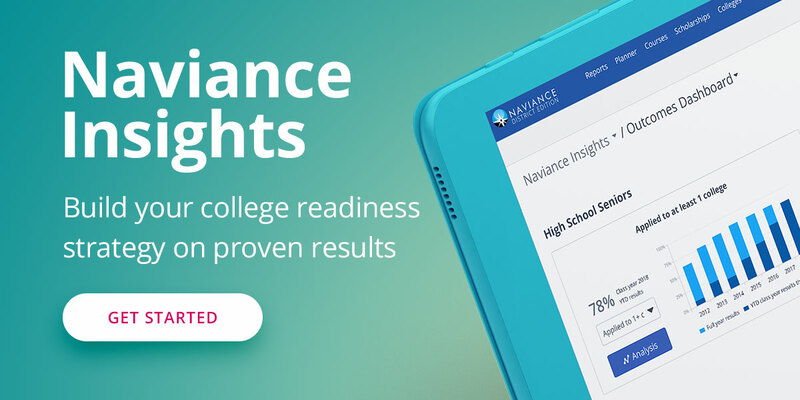 Naviance helped relieve a number of anxious students and their parents who, quite honestly, had more pressing concerns after nearly a week without power. Once power was restored to the school, one counselor who lives locally e-mailed students via Naviance and offered to meet them at the school over the weekend to further relieve their concerns. I cannot imagine how we would have handled the situation before Naviance. When school finally did re-open on November 5th we were not faced with the bedlam one would have expected as our communications with students and parents were very effective in easing their concerns. I am in my 37th year as a school counselor. I have seen a lot of innovations over the years, but Naviance has surpassed all of them. Naviance, second only to my secretary, is my most valued resource in the guidance office.